The Peace Day Challenge exists to raise the profile of the International Day of Peace and to affirm peace as a real alternative to the violence we see every day in the news. It is all about inspiring a day of action on September 21, focused on building peace through real-life activities and sharing on social media at #PeaceDayChallenge. Since launching in 2015, the Peace Day Challenge has reached over 100 million people in some 150 countries on social media, engaged dozens of organizations and high-profile individuals, and inspired activities in more than 30 countries & in states across the United States. Help defuse or resolve a disagreement. Engage in an act of volunteerism or service to help those in need. Hold an event in your community to mark the International Day of Peace and raise awareness about peace issues that matter to you. Spread the word about an organization that's working to help people affected by violent conflict. If you are in Washington, DC, walk the Peace Trail on the National Mall to learn about peace through history. In 2018, USIP collaborated with Scholastic to create a "Poster Teaching Guide for the Peace Day Challenge in 2018." The poster was distributed to 50,000 middle school classrooms across the U.S. to support educators and their students in taking action on the International Day of Peace (9/21) and continuing their learning and engagement year-long. Challenge other faith leaders in your community or country to share in an inter-faith event to mark the International Day of Peace. Arrange a pot-luck dinner and invite practitioners of other faiths to attend and break bread. Select and share passages and proverbs from the Bible, Koran, Torah, etc. that promote peace and mutual respect of one another. Encourage followers to have a half-hour conversation with someone with whom they disagree. 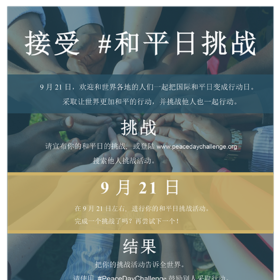 Challenge people from your community to commit to 24 hours of peace on September 21st. Encourage people from your community to engage in an act of service to help those in need or to make another positive difference that promotes peace in your area. Work as a group to construct a symbol of peace, such as folding paper cranes or planting olive trees, to serve as a reminder to pursue peace. Share photographs that help illustrate your vision of peace, either in person or online using the #PeaceDayChallenge. Spread the word about an organization that’s working to help those affected by violent conflict around the world. Post the Peace Day Challenge flyer in your office or community center to raise awareness of this day. Encourage schools, libraries, and bookstores in your community to promote books about peace themes, and to dedicate “story-time” activities for children to peace literature, on September 21st. Reach out to youth organizations to empower them take action on the Day of Peace. Highlight an issue on which you are working that advances the cause of peace, share what you are doing, and encourage others to join in at #PeaceDayChallenge. 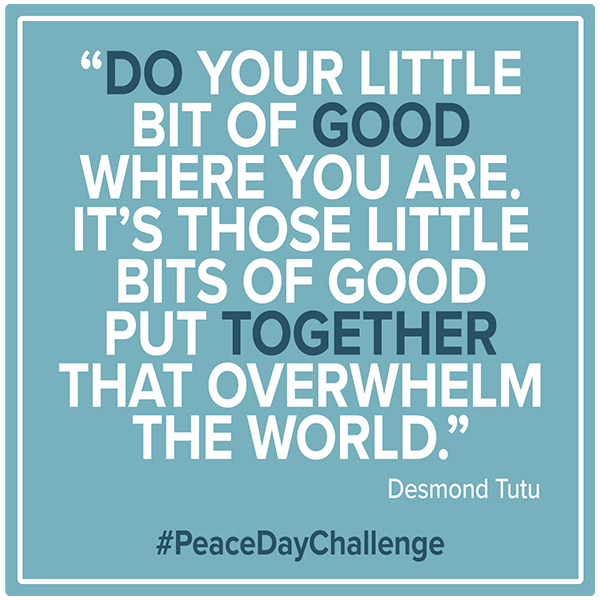 Find a quote about peace that inspires you to act, and share the quote and the action using #PeaceDayChallenge. Share a meal with a student from a different country. Help defuse or resolve a disagreement—in class or at home. If you play sports, meditate on peace during your stretches and warm-up exercises. Speak up when you see someone being intolerant or being a bully. Post messages of peace around your school. Show kindness to someone in your school or community who needs it. Engage in an act of volunteerism or service to help those in need or to make another positive difference that promotes peace locally or globally. Challenge people from your school to commit to 24 hours of peace on September 21st. Organize an event at your school to mark the International Day of Peace – it can be a school-wide assembly, a peace walk, an evening event, or a lunchtime program to highlight peace themes, draw attention to the day, and spark further conversation among the students. Create a Peace Club in your school or community, to educate yourselves about peacebuilding, gain new skills, and identify ways to take action! Find out how with our Starter Kit! Read a book about peace to a younger sibling or neighbor. Make a personal pledge to be a peacebuilder from now on, by seeking nonviolent ways to manage conflict and by seeking out opportunities to take positive action for peace in your community and in the world. Create a “peace pledge” for your school or organization or community, expressing your values and your commitment to taking action to build peace going forward. Create or contribute to a piece of public art, like chalk drawings or a mural, to raise awareness in your school and community about the International Day of Peace. Make a video about a peace-related issue that matters to you and why; spread the word by sharing it with others on social media. Encourage your students to take collective action on September 21 st around an important issue to advance peace in their school, community, or world. Support your students in organizing a Peace Club as a means for sustained learning and action for peace. Organize an event at your school to mark the International Day of Peace – it can be a school-wide assembly, a peace walk, a fundraising activity, an evening event, or a lunchtime program to highlight peace themes, draw attention to the day, and encourage conversation among the students. Discover diverse meanings of conflict with your students through Extension Activity 1, “Understanding the Language of Conflict through Metaphors,” from Lesson 1.1 in the Peacebuilding Toolkit for Educators – High School Version. Explore perceptions of peace through Lesson 1.2 in the Peacebuilding Toolkit for Educators – High School Version and Middle School Version. Encourage students to research peace symbols in the U.S. and in other parts of the world and ask them to design their own peace symbols in small groups. Discuss and analyze popular songs or movies with peace messages. Have students work in small groups to research proverbs around the world about peace and select one to present to the class. They can present the meaning of the proverb as a human statue, a drawing, or in some other way. Introduce your students to the process and skills of mediation using Lesson 2.9 in the Peacebuilding Toolkit for Educators – High School Version and Lesson 2.4E in the Peacebuilding Toolkit for Educators – Middle School Version. Check your students’ knowledge of peacebuilders and challenge them to learn more about individual peacebuilders in Lesson 3.1 of the Peacebuilding Toolkit for Educators – High School Version and Middle School Version. Help your students identify international, national, and local peace organizations and ways to support them in Lesson 3.2 of the Peacebuilding Toolkit for Educators – High School Version and Lesson 3.3 of the Middle School Version. Work as a school community to construct a symbol of peace—such as folding paper cranes, planting olive trees, or designing a peace path or peace garden—to serve as a reminder to pursue peace. On your own, with colleagues, or with your students, make a video about a peace-related issue that matters to you and why; spread the word by sharing it with others on social media using #PeaceDayChallenge. Bring stories of global peacebuilders into your classroom through multimedia resources from USIP. Post the Peace Day Challenge flyer in your office and share broadly on social media to raise awareness of the day and encourage broad participation in action for peace! Put a banner on your webpage linking to www.peacedaychallenge.org. Use September 21 st as an opportunity to highlight some of the year-round activities your organization does to support peace, and encourage broader support, using #PeaceDayChallenge. Use our Action Kit to organize an event to mark the International Day of Peace and raise awareness of a peace issue that matters to your staff or your members/network. There are many formats to choose from—a film screening, a book club discussion, a poetry reading, a public forum with a guest speaker, an inter-generational teach-in, a bake sale or other fundraising event to raise money for an organization that is working to help those affected by violent conflict, etc. Create or promote a group volunteer opportunity that will contribute to positive change in your local community, and encourage your staff and networks to join. Create an award or other form of recognition for local peacebuilders who are making a difference in your community. In your organization, make a video about a peace-related issue that matters to you and why; spread the word by sharing it with others on social media using #PeaceDayChallenge. In your organization, find a quote about peace that inspires you to act, or find/create an image that represents your vision for peace, and share as inspiration for others using #PeaceDayChallenge. Above all - Share your Peace Day Challenge, and challenge your friends, family & co-workers to take action for peace, too! #PeaceDayChallenge! 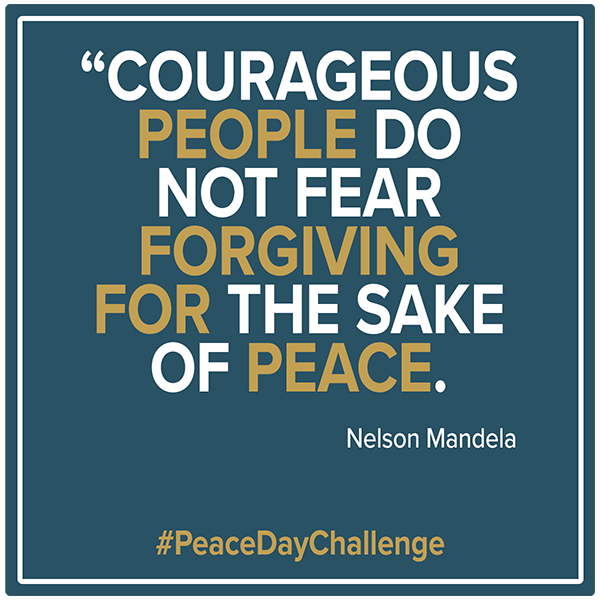 The Peace Day Challenge is a global effort to turn the International Day of Peace into a day of global action that affirms peace as a real alternative to the increasing violence we see daily. It encourages people to build peace on September 21, and to inspire others to join in, using the social media tag #PeaceDayChallenge. We invite you to commit to the Peace Day Challenge by taking an action on or around September 21 and sharing it on your social media accounts. 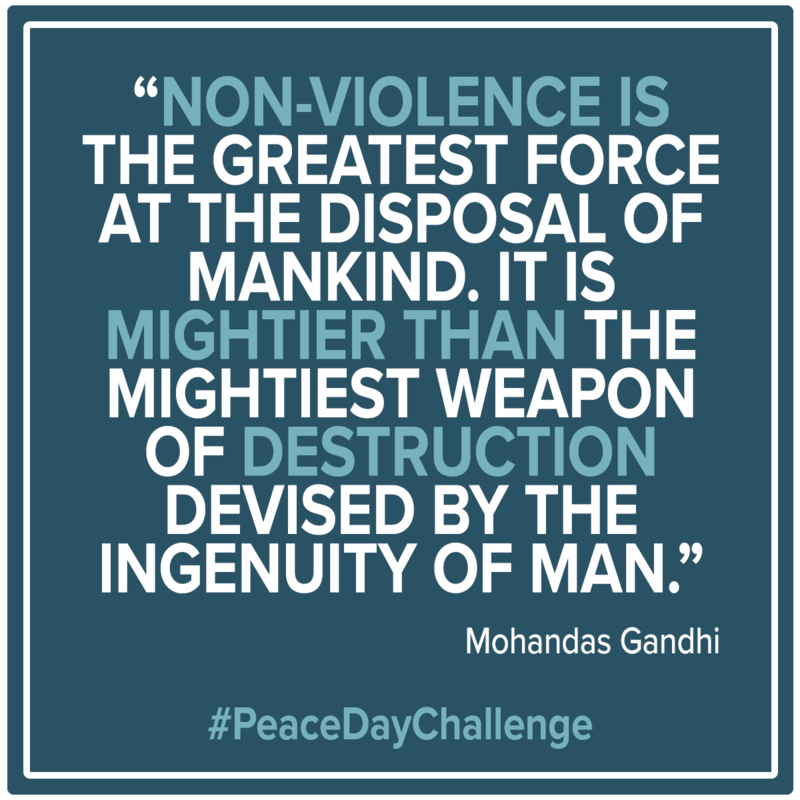 Promote your involvement with the Peace Day Challenge and the International Day of Peace with the materials in this kit, or use them to inspire your own online campaign. 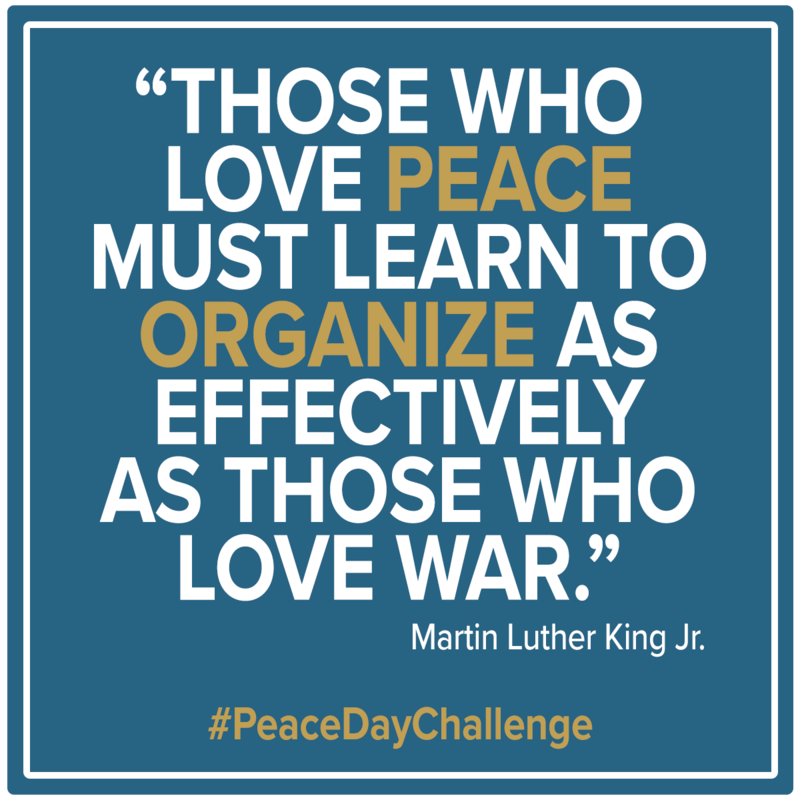 Head to usip.org/peacedaychallenge to get ideas for action. Share your commitment on your networks using the hashtag #PeaceDayChallenge. Record and share a 15-second video of you issuing your challenge. Encourage others to participate by sharing our #PeaceDayChallenge graphics and flyers, or create your own. In your posts, be sure to tag specific people or groups you’re challenging so they know about it. Tag @USIP on Twitter, @usinstituteofpeace on Facebook, and @usipeace on Instagram so we can re-share! We’re doing [XXXXXX] for the #PeaceDayChallenge! What about you? Ask your followers to take an action for the #PeaceDayChallenge and share it. Keep the conversation about peace going! 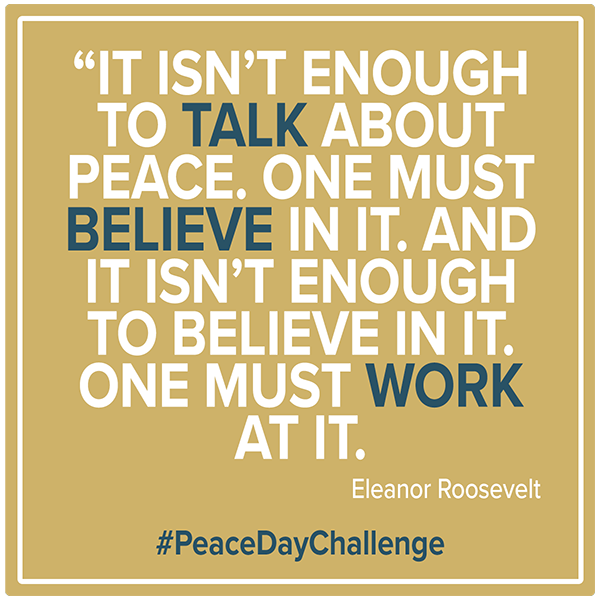 Follow #PeaceDayChallenge, share your peace-related resources, and find more ways to stay engaged at www.usip.org. For questions or for more information, please contact: Steven Ruder, Digital Communications Officer, U.S. Institute of Peace (@USIP), sruder@usip.org.